Ocracoke Island is a magical place. For more than three hundred years, pirates, sailors, ship captains, castaways, renegades, and assorted other eccentrics have called Ocracoke home. In this volume you will encounter compelling island history, eerie ghost stories, intriguing maritime legends, and gripping local tales, all collected and told by Philip Howard, eighth generation descendant of William Howard, Blackbeard's quartermaster and last colonial owner of Ocracoke Island. Be prepared to meet the elusive ghost who prowls the halls of one of Ocracoke's vintage hotels. Delve into the history of North Carolina's oldest operating lighthouse. Trace the dynamic natural forces that continue to shape the village and the island. Explore traditional stories of spectral visitors, tokens of death, and murders of passion. Follow the development of the island's earliest schools. Relive the fearsome 1837 wreck of the elegant steamboat Home. Read about a young islander's astonishing dream of death. 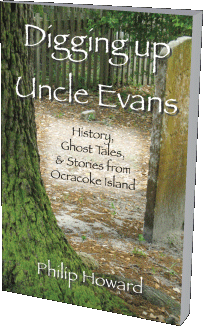 All these tales and more come alive in Digging up Uncle Evans, stories based on Philip's popular Down Point Ghost & History Walk.